In my mind whenever I see brackets, I always think of big hugs. Yes, I see curvy arms surrounding their contents in a big hug. Fuss Free: Big Hugs 3 and Fuss Free: Big Hugs 4 are the latest sets in my template series designed around brackets and bracket mats ~ a perfect start and finish to any layout. Purchase Fuss Free: Big Hugs 3 and receive Fuss Free: Big Hugs 4 FREE! Offer valid through March 5, 2014. Have a great week! Make sure you hug someone you love! Shake it like a polaroid picture! 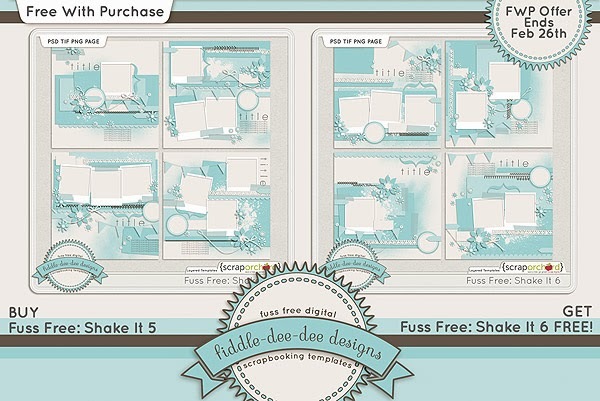 Fuss Free: Shake It 5 and Fuss Free: Shake It 6 are templates designed to appear as if instant photos/instagrams have been tossed onto your layout. Most of the templates feature spots for multiple photos, and are topped with a variety of elements. Purchase Fuss Free: Shake It 5 and receive Fuss Free: Shake It 6 FREE! Offer valid through February 26, 2014. Just a reminder to grab the free templates I've been posting about this month. We are heading into a new month at the end of next week, so that means more new free templates! Have a great week creating memories and scrapping them! 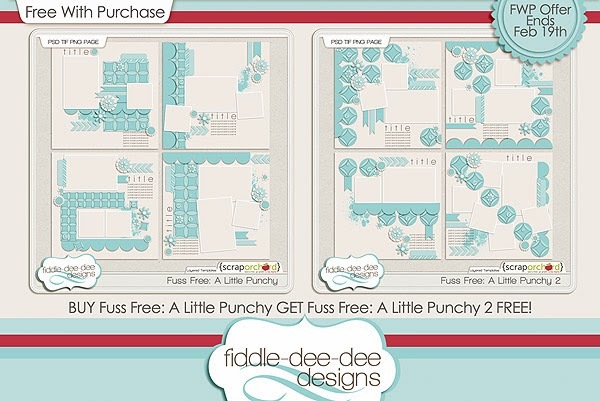 Fuss Free: A Little Punchy and Fuss Free: A Little Punchy 2 templates are inspired by creative uses for punched pieces of paper and provide a fun and whimsical way to include a variety of papers as well as add dimension to your layouts. Purchase Fuss Free: A Little Punchy and receive Fuss Free: A Little Punchy 2 FREE! Offer valid through February 19, 2014. 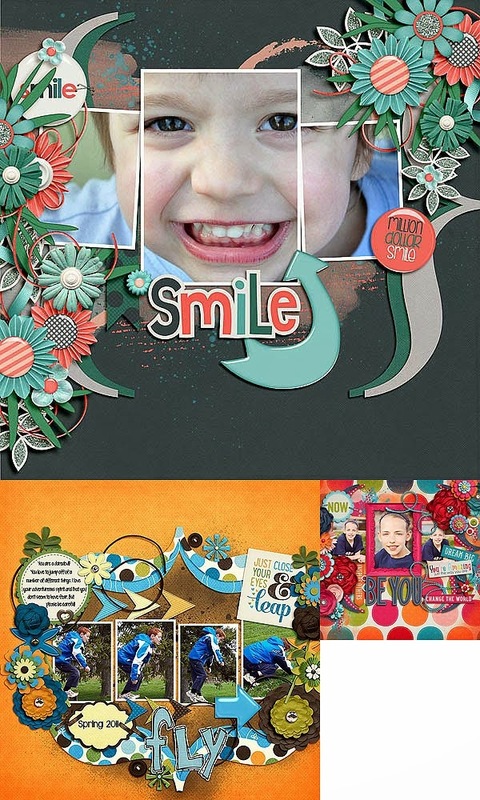 Liz of Scrapping With Liz was also inspired to make similar templates in her own style called Paper Piecing Templates. Check these out! Aren't they beautiful? Make sure you are signed up for my newsletter because Liz gave me a coupon code to share with y'all! Woo-Hoo! 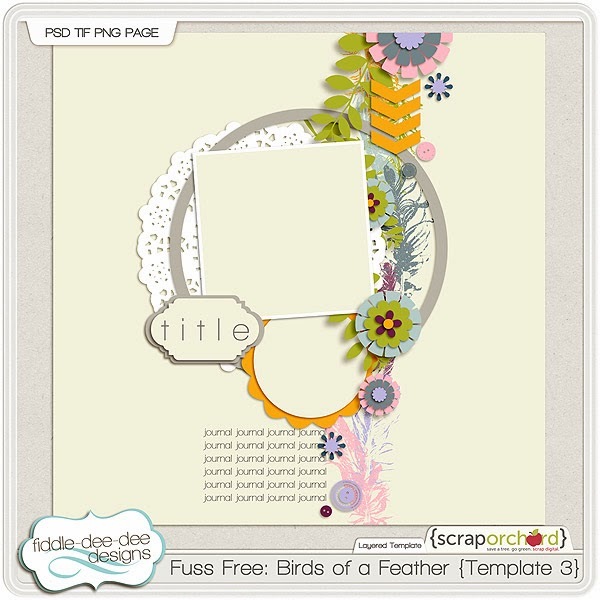 Finally, check out the Scrap Orchard Blog and the latest post for Template Tuesday! I have this new template freebee ready for you to download! 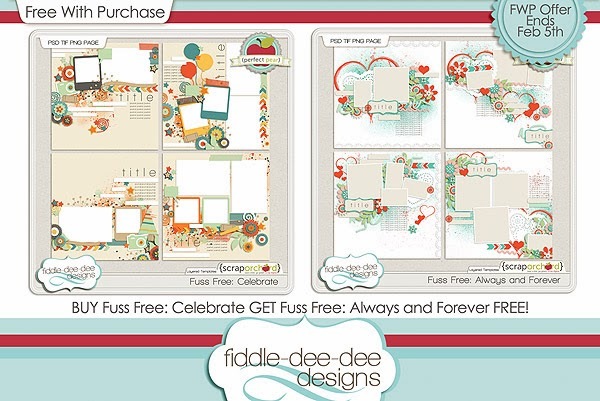 Designed to coordinate with Amber Shaw's new Grab Bag Celebrate, Fuss Free: Celebrate templates are a fantastic choice to create multiple layouts of all your birthday celebrations! Check out this peek at Amber's Celebrate Birthday Grab Bag! It's a great bargain ~ only $5! 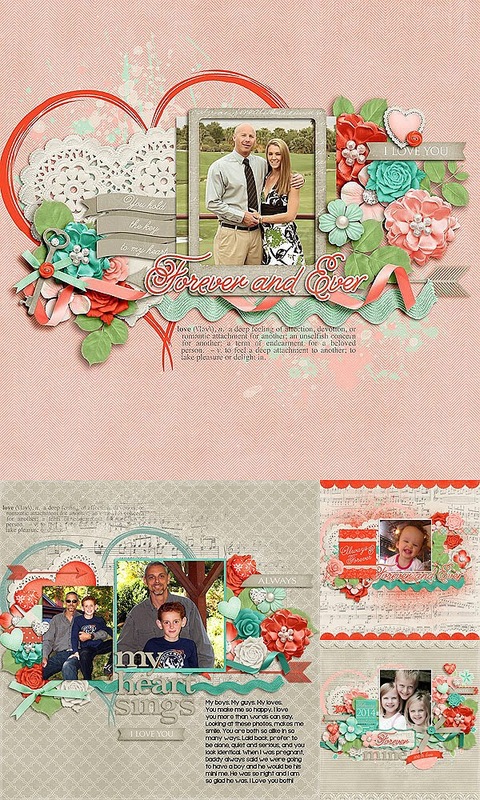 Designed to coordinate with Megan Turnidge's new collection Always and Forever, Fuss Free: Always and Forever templates allow you to quickly make gorgeously layered layouts of the loves of your life! Here is Megan's beautiful kit, Always and Forever! Purchase Fuss Free: Celebrate and receive Fuss Free: Always and Forever FREE! Offer valid through February 5, 2014. The January Template Challenge has been posted at My Scrapbook Art and you can download this free template for your stash. This is your last week to pick up this template because February's template is scheduled to be coming your way on February 6th! My free template for January's Template Tuesday is still available. 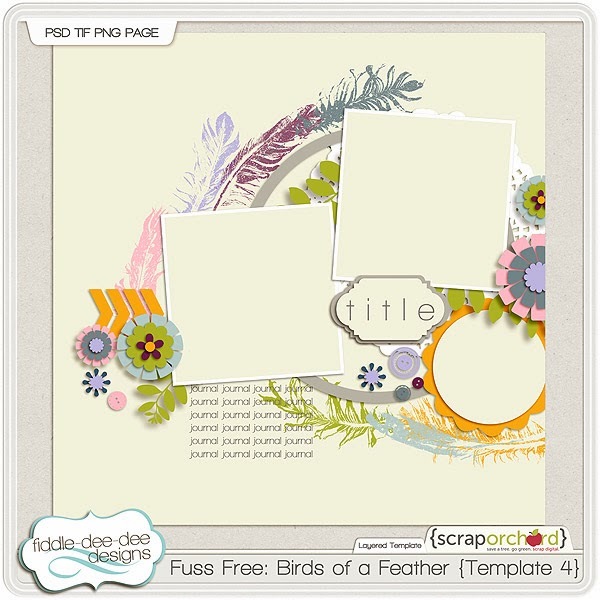 Click on the image to go to the Scrap Orchard Blog to download this template. February's template will be available on Tuesday, February 11th. 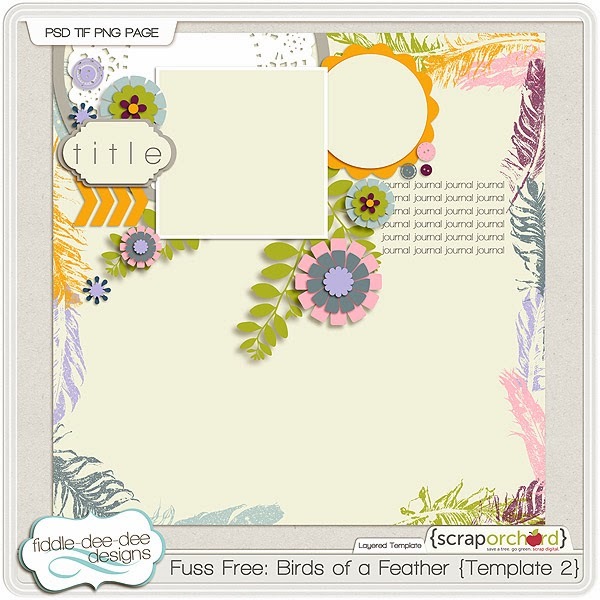 If you are collecting my freebee templates, please note that I will have a free template available to you in our Scrap Orchard newsletter each month. I don't know which week my free template will be available, so please be sure to check the newsletter for it, and download and unzip it before you delete your newsletter. You will only be able to download these free templates from the newsletter. 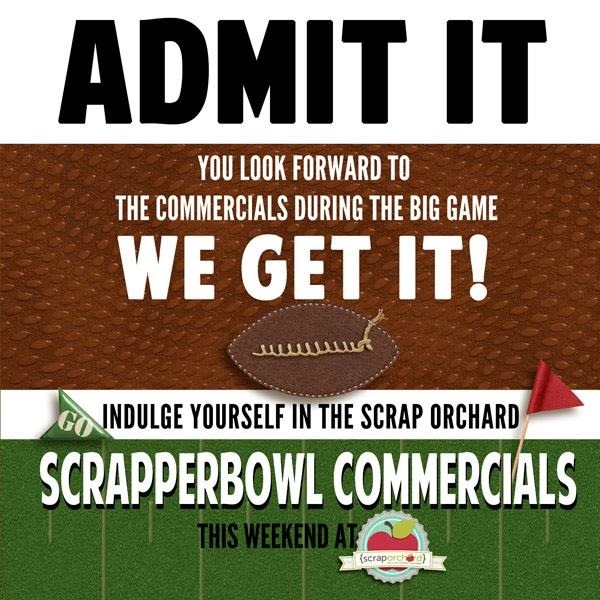 Scrapper Bowl 2014 is here! Pop over to the forum to read all the details about participating in the Fantasy Scrapper Bowl and the Scrapper Bowl Challenges. Check out the prizes this year! We will have these amazing prizes as well as chats, challenges and games AND we are adding something new this year as well. We'll have commercials in our challenges! Click on the image below to get a peek at the first video from WendyBird Designs. We are having a Storewide Free With Purchase. 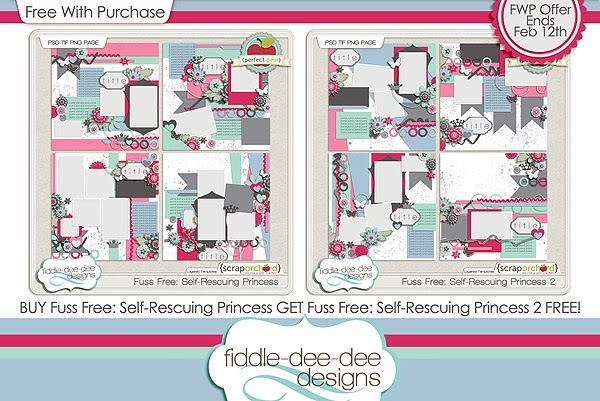 Spend $10 and get the Birds of a Feather kit and spend $15 and you get the kit and the add on. 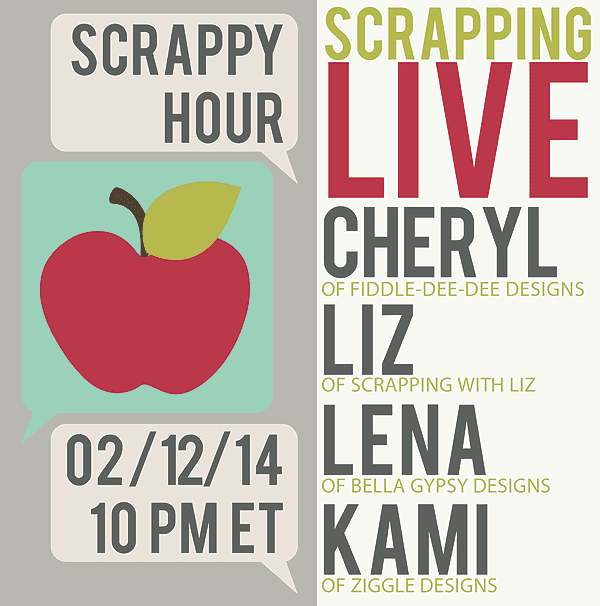 To kick off our Scrapper Bowl Event, we have put together a wonderful Facebook Hop! 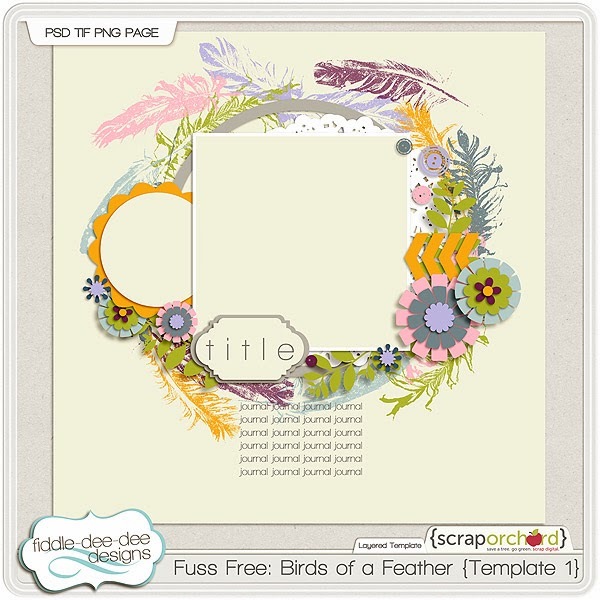 Stop by my Fiddle-Dee-Dee Designs Facebook Fan Page to get this awesome template that coordinates with the Birds of a Feather collection. When you are there, follow the feathers to move backward and forward and collect all the other free pieces! I also have this template that you can download from right here on my blog (click on the image to download)! We have retired all of our Megas to make way for Fruit of the Month! Each month a group of our designers will be selling individual, coordinated kits! If you purchase all of the products in the Fruit of the Month category, you will receive 50% off and an additional add on for free! Well, that's it from me right now! Whew! That was a lot! LOL Hope you have a fantastic weekend as you scrap and watch football and take pictures and make memories!